mad orange fools: Finally a good snowstorm! It's been snowing all day long and I love it! I love sunshine too, but it's wintertime and we were long overdue for a nice snowfall here in Santa Fe. Simon, on the other hand, is less than thrilled. 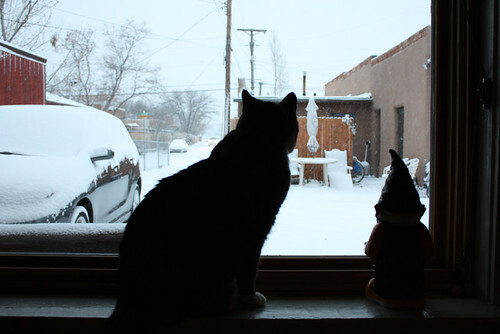 He sits in the window and glares at the snow. He wants to go outside so badly, but he just can't tolerate the cold and snow. Rocky is a little tougher and actually enjoys playing in the snow sometimes. But mostly, with this kind of weather, they both stay in and nap. The downside being that they tend to bug in the middle of the night as they are stir crazy, want to go out and have forgotten that there is snow on the ground. Will and I took a little walk to the railyard this afternoon and it was so nice to be out in the falling snow. We did the last of our holiday shopping. 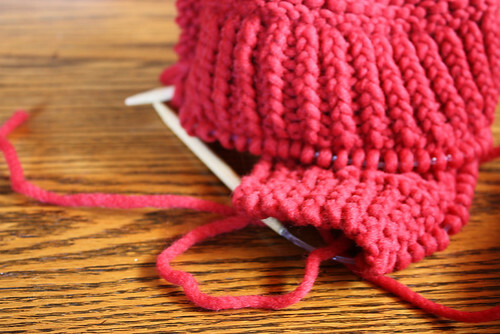 Now if only I could get all my knitting done! The weekend kind of got sucked up with shopping and then football on Sunday so I didn't get my usual knitting time in. I've done a bit today, but I have still have a scarf to finish, another cowl and two hats. We're actually going to bundle up again in a few minutes and have a nice, warm dinner at Tomasita's. Yum. Love being able to walk to my favorite New Mexican restaurant!! 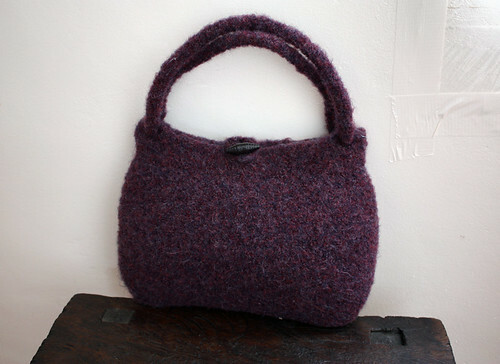 I really dig this felting business. It's really soft and warm. 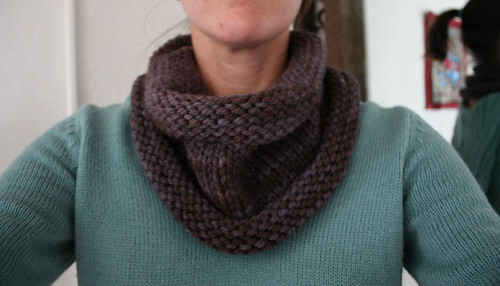 I'm obsessed with cowls these days. 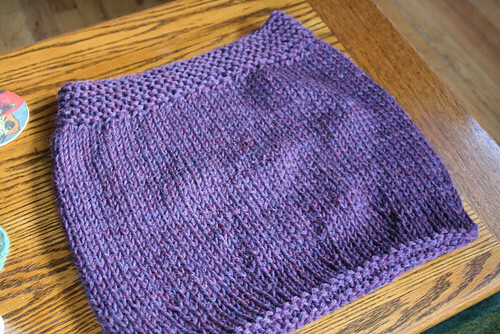 I used this pattern which knits up super quick and boy, that Malabrigo Chunky is super nice yarn. Love it. This is the beginnings of the Shalom Cardigan which is for me and which I had hoped to finish by Christmas Day, but it's just not going to happen. Oh well. Maybe I can get it done in time for New Year's Eve! Not that we even go out, but hey, at least I'll have a new sweater to wear. Alright, I must go feed the kitties now as they have very hungry bellies and little else to do besides eat and sleep.